Scientists have discovered a 31km wide impact crater beneath the Hiawatha glacier in Greenland. The discovery, published in Science Advances, was made using airborne radar surveys which unveiled a circular bedrock depression beneath the ice. The presence of quartz and other grains and features on the ground helped the team confirm the finding – these showed signs of having been subjected to large shock pressures. Despite this lack of evidence, we know that meteorite impacts can produce dramatic changes to the local environment. Larger ones can even have a drastic effect on the global environment – bringing about mass extinctions. The huge Chicxulub crater in Mexico, for example, is believed to have contributed to killing the dinosaurs. An ice-sheet in Greenland’s Inglefield Land is hiding the Hiawatha crater. But how can one localised impact wipe out entire species? 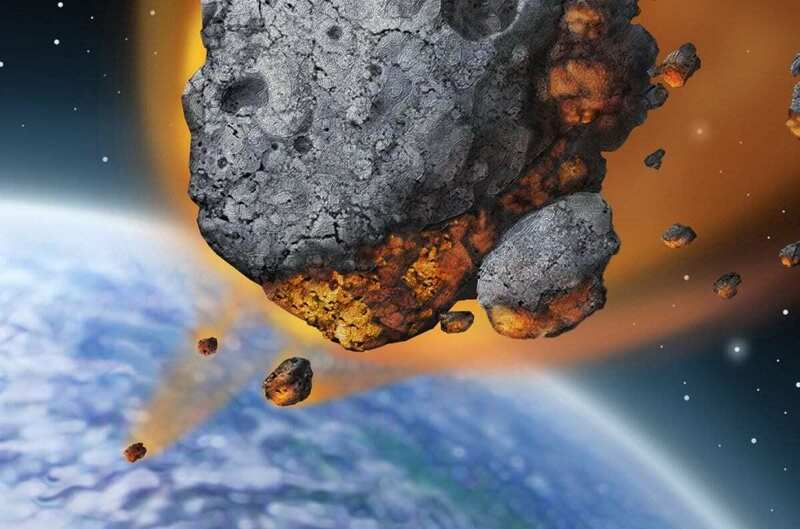 The initial impact and shock wave from an asteroid can wipe clear life within a substantial radius. Everything gets scorched from the heat of the impact – producing a desolate barren landscape. Shock waves passing through the body of the planet can also give rise to destructive earthquakes, tsunamis and volcanoes. But it is the lasting effects of the impact that has the potential to cause the most serious changes. A large volume of debris ejected from the crater can travel far and spread all over the world. As a result, an increased number of particles in the atmosphere can block out sunlight, changing the climate and preventing photosynthesis – ultimately having a devastating effect on the food chain. Eventually the particles in the atmosphere fall back to Earth and light returns, along with life. The species that survive may be better able to prosper in a new world where many larger creatures, as was the case with the dinosaurs, have become extinct. Clearly, such impact events have redirected the history of the Earth and paved the way to aid in the evolution of our own species. It is interesting to think about whether the world would be the same as it is today if the Chicxulub impact never happened – or even the impact found in Greenland. There is evidence that three impacts are possibly related to mass extinction events, including the Cretaceous-Palegene events caused by Chicxulub. We also know that the majority of marine species and terrestrial vertebrates became extinct during the Permian Triassic eventsome 252m years ago, thought to be caused by the asteroid impact leaving behind the Wilkes Land Crater in Antarctica. Meanwhile, the Popigia impact in Siberia about 35m years ago is linked with the Eocene-Oligocene event, which wiped out many marine species. All these impacts created craters a whopping 100km across or more (170km for Chicxulub), suggesting that the 31km crater in Greenland may not have been as devastating to the Earth. However, it would have drastically changed the local environment and reset the life race within that area. If it is really true that the Greenland crater was created 12,000 years ago or more, it could explain a mysterious feature called the Younger Dryas event. This was a sudden and dramatic change in climate – a glacial period about 12,900 to 11,700 years ago, followed by gradual climatic warming. Previously, scientists believed that this event was caused by a meteor exploding before impact, which would also have caused changes to the local environment. The abrupt climate change is thought to have had a drastic effect on the large mammals of North America. For example, it is believed to have helped cause extinction of the mammoths and mastodons. We know that most woolly mammoth populations disappeared between 14,000 and 10,000 years ago. Early human hunter gatherers may have also had to adapt to cope with the change in climate from this event by changing hunting habits or even migrating to more suitable areas. Clearly impact from space can have devastating consequences for life on Earth. So what if one hit today? The Minor Planet Centre in Massachusetts, US, has been collecting and cataloguing the orbits of asteroids and comets since 1947, and NASA has a similar Near Earth Objects programme. If a body is discovered to be on an intercept course there are prevention plans in place, ranging from deflection and launching spacecraft to move the asteroids to a new orbit to blowing the asteroid up. Unfortunately, all these have their drawbacks and take years to plan – meaning this work may be too little too late. Indeed, the late physicist Stephen Hawkins stated that an asteroid collision “is the biggest threat to our planet” and one that we cannot have control over. Despite all our monitoring and preparation, a large body may sneak up quickly. And, as previous impacts have taught us, while the damage may not be enough to destroy the world, it could drastically change it – maybe even for the better.